Turmeric is a bright yellow spice, usually found in the form of a dried powder made from the dried ground root of the plant of the same name, but fresh turmeric root can also be found in some mainstream supermarkets. 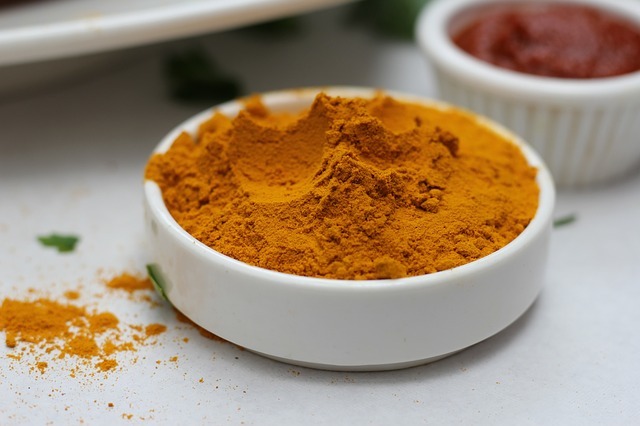 Turmeric is often associated with Indian cuisines and is a key ingredient in many curries (it is a main ingredient in commercial curry powders), but is commonly used in much of Asia. It has an deep, earthy flavor and is not spicy at all by itself, but is often paired with chilies in more spicy dishes. In foods outside of South Asia, turmeric is used as a coloring for beverages, baked goods, orange juice, sauces, and other products. In South Africa they use turmeric to give their rice a nice golden shade. Choosing: If you want turmeric for use in recipes, look for a powder with a bright marigold or orange-yellow color. Most prepackaged turmeric is fresh enough for most recipes, but if you are lucky enough to have a spice shop in your city where you can purchase an even fresher product it's definitely worth the trip. Select turmeric with a strong scent, which doesn't clump together or exhibit any signs of mold or dustiness. The color should be fairly bright (although this varies) and not faded. Buying: you can buy turmeric at your local grocery or supermarkets. Procuring: Turmeric needs hot, moist, tropical land. In the areas where it thrives, it needs little attention. It is propagated from rhizomes. Turmeric is mainly used in curries and other spiced dishes. It is an essential ingredient in commercial curry powders. It can be found as a natural coloring in prepared chicken or vegetable stock and sock cubes too. Turmeric can be used in pickles and chutneys, in Picalilly relish; turmeric gives flavor to pilaus and color to sweet dishes. In North African and Middle Eastern cuisine, tumeric is added to sauces, cous-cous and rice dishes. As with ginger, the spice is produced from the roots of the plant. The rhizome has to be boiled, dried, and ground to a fine yellow powder before use. Dried pieces of root can be obtained sometimes, but it is almost impossible to grind them at home. Turmeric is usually available as powder. Buy little and often for the freshest, purest flavor, as recommended with all ground spices, because, although the powder keeps its coloring properties indefinitely, it loses flavor and it can turn musty if kept for too long. History: Turmeric (Curcuma longa) and several other species of the curcuma genus grow wild in the forests of Southern Asia including India, Indonesia, Indochina, nearby Asian countries, and some Pacific Islands including Hawaii. All of these areas have traditional culinary and medicinal uses going back to pre-history. In the Indian Ayurveda system of herbal medicine, turmeric is known as strengthening and warming to the whole body. Traditional uses in India include to improve digestion, to improve intestinal flora, to eliminate worms, to relieve gas, to cleanse and strengthen the liver and gallbladder, to normalize menstruation, for relief of arthritis and swelling, as a blood purifier, to warm and promote proper metabolism correcting both excesses and deficiencies, for local application on sprains, burns, cuts, bruises, insect bites and itches, for soothing action in cough and asthma, as antibacterial and anti-fungus, and in any condition of weakness or debility.